How a toy-obsessed artist is building an empire, one LEGO at a time. By Jonathan Bender. Photographs by Jani Zubkovs. Who he is: A LEGO-Certified Professional, artist Sean Kenney, 32, has built commissioned LEGO sculptures for clients like Google and Mazda. He has also written Cool Cars and Trucks, a children's picture book�building guide that will be out September 1. Starting out: "As a kid, I was a complete LEGO maniac. It was the only thing I asked for on my birthday," says Kenney. He remembers building a four-foot-tall nuclear submarine by combining collections with a friend (first itemizing every brick to ensure no one went home with any of the other's LEGOs). The submarine featured working torpedoes fashioned from tiny rubber bands used for braces. "Today, I build four-foot sculptures for breakfast," jokes Kenney. Turning point: In 2002, Kenney was designing website user interfaces for Lehman Brothers during the day. At night, he would build with the LEGO collection he had rescued from his parents' house upon graduating from Rutgers University four years earlier. In the middle of an argument with a colleague, he stood up, took off his ID tag and pager, and quit. "I had just left this six-figure gig, and all I could think about was getting home to play with my toys." 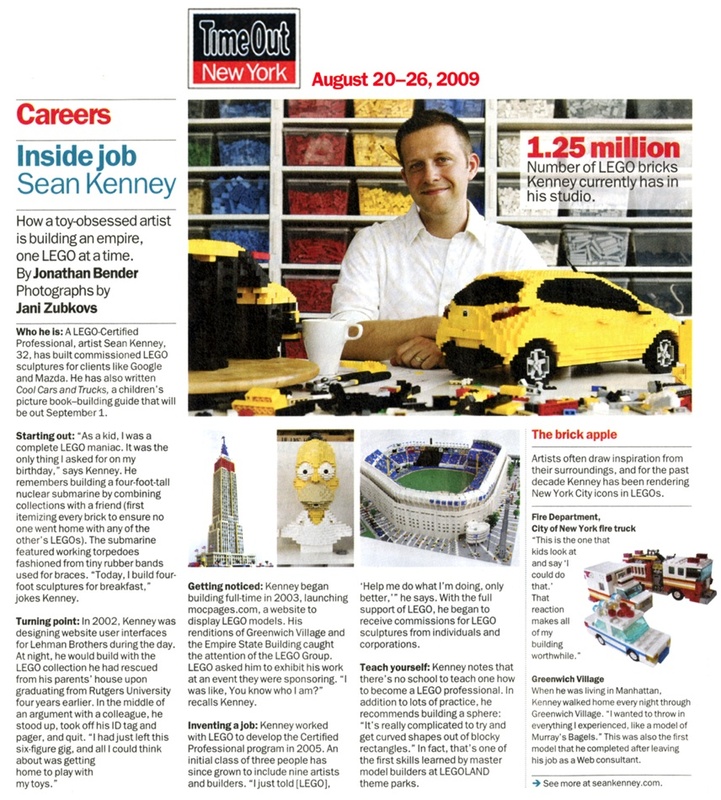 Getting noticed: Kenney began building full-time in 2003, launching mocpages.com, a website to display LEGO models. His renditions of Greenwich Village and the Empire State Building caught the attention of the LEGO Group. LEGO asked him to exhibit his work at an event they were sponsoring. "I was like, You know who I am?" recalls Kenney. Inventing a job: Kenney worked with LEGO to develop the Certified Professional program in 2005. An initial class of three people has since grown to include nine artists and builders. "I just told [LEGO], 'Help me do what I'm doing, only better,'" he says. With the full support of LEGO, he began to receive commissions for LEGO sculptures from individuals and corporations. Teach yourself: Kenney notes that there's no school to teach one how to become a LEGO professional. In addition to lots of practice, he recommends building a sphere: "It's really complicated to try and get curved shapes out of blocky rectangles." In fact, that's one of the first skills learned by master model builders at LEGOLAND theme parks. Artists often draw inspiration from their surroundings, and for the past decade Kenney has been rendering New York City icons in LEGOs. "This is the one that kids look at and say 'I could do that.' That reaction makes all of my building worthwhile." When he was living in Manhattan, Kenney walked home every night through Greenwich Village. "I wanted to throw in everything I experienced, like a model of Murray's Bagels." This was also the first model that he completed after leaving his job as a Web consultant.